The Johnny Appleseed most of us learned about in our early school days was a pioneering do-gooder; a man who planted apple seeds so others could have delicious food to eat. That history is a little off the mark. The man known as Johnny Appleseed did plant apple trees for pioneers heading west, but he planted them as a shrewd businessman designing a future for apples to be used in the creation of hard cider. What did hardscrabble travelers and homesteaders need more than apple pie? Booze. They wanted something buzzy to drink, and they needed something reliable to consume when the water around them came with a host of gut-churning microbes. Johnny Appleseed was a visionary gardener of epic scale, to be sure. 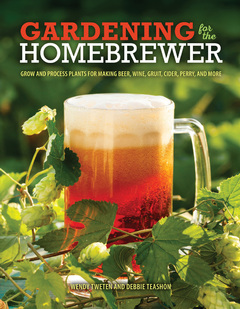 And as authors Wendy Tweten and Debby Teashon so perfectly state in their new book, Gardening for the Homebrewer: brewing and gardening are good companions, and making cider (the hard stuff; not just plain apple juice) goes hand in hand with growing your own fruit. As American as apple pie? Think again. When the colonists planted their orchards they had something else in mind. Two hundred years later, when Johnny Appleseed wandered the wilderness patting pips into feral soil, it wasn’t so that hardscrabble homesteaders could enjoy a nice dessert. No, our forebears weren’t obsessed with flawless red fruit that could be eaten out of hand; they preferred their apples juiced and fermented. On the frontier, apple trees meant hard cider, the true spirit of the New World. Forget the pastry; the real measure of patriotic purity is as American as apple cider. Fruit that could be cooked or eaten fresh was certainly a bonus, but what settlers really needed was a drink both tasty and dysentery-free. Water could carry a host of nasty microbes, from E. coli to cholera and typhoid. The ethyl alcohol of fermented cider keeps these bowel- destroying pathogens at bay. Other low-alcohol options such as beer and wine were reluctant to adapt to the new continent. European grapes, hops, and barley sulked and succumbed to unfamiliar pests and diseases. Wine made from indigenous grapes was simply unpalatable. Fortunately, parched sodbusters found the cure to their thirst hanging from the branches of the resilient apple tree. Apples have an amazing adaptive advantage: they produce wildly variable offspring. The trees may be tall or shrubby. Leaf shapes and colors vary, as do branching habits. And the fruit! Sexually propagated apple fruit appears in a seemingly endless array of colors, sizes, textures, time of ripening, and—of course—flavors. We may hope our seed-grown tree will offer up sweet apples with a juicy crunch, but the new fruit are just as likely to be punky, puckery, or taste the way old socks smell. This genetic scramble makes breeding for specific traits a challenge for pomologists, but it gives the genus a distinct advantage in conquering new lands. If enough seeds are allowed to sprout and grow, a few are likely to possess characteristics that will allow them put down roots in their new home. A hybrid may have a tolerance for sub-zero winters, survive damp soil, or have a natural resistance to local pests. Apples seem limited only by the need for a relatively temperate climate. Although many wildlings will produce “spitters”—fruit unfit for eating—this astringency is a bonus when it comes to cider. Once the apple had settled in North American soil, it began to pursue its own destiny, possibly interbreeding with native crabapples, branching out apace with the country itself. Throughout the seventeenth and eighteenth centuries, cider was a staple of American life. Everyone, it seems, consumed the mildly alcoholic beverage, even children—who were offered a watered-down version known as ciderkin. Hundreds of thousands of gallons were produced annually. Not only was fermented cider an important part of the pioneer diet, it was a means of preserving a valuable harvest. For two hundred years, Americans and apples enjoyed a mutually beneficial coexistence: the humans got a healthy drink that delivered a gentle buzz; the trees got a golden era of diversity and the chance to colonize a continent. Then, in the late 1800s, along came Carrie Nation, the Temperance Movement, and eventually Prohibition, and down went the apple trees, literally and figuratively. The apple had become forbidden fruit. As cider fell out of favor, orchards were destroyed and generations of apple diversity were lost. Eventually, in a massive re-marketing, the apple emerged with a sober new image as a nutritious fresh treat and dessert ingredient. Now cider is back. From 2009 to 2013, US sales of hard cider increased fifty-four percent annually. What’s old is new again as we come to re-appreciate fermented apple juice as a drink not only delicious in its own right, but as a natural accompaniment to food of any ethnicity. Could America’s thirst for cider eventually outstrip that of the Brits, who have the highest per capita consumption of the drink and turn nearly half of their commercial apples into cider? Craft cideries are springing up across America faster than apple pippins on the frontier. And the trend has not gone unnoticed by hobbyists. Cidermaking lends itself to home production; after all, for centuries it was the stuff of peasants and farmers who didn’t have the luxury of fancy equipment or free time. Freshly pressed, raw apple juice is known as sweet cider in the states. If not chilled or pasteurized, the amber liquid quickly begins to ferment into hard cider. The term “hard cider” is a modern American one. Before the accessibility of refrigeration to slow the fermentation process, virtually any cider more than a few hours old was already “hardening.” In European pubs and cafés the drink has always been known simply as cider—the alcohol is implied. This alcohol comes as a waste product of yeasts that naturally accompany apples. So anxious are these yeasts to gobble up the liberated sugars of juiced apples that they are often capable of fermenting all on their own, although cidermakers may choose to replace them with commercial yeasts for better control or to achieve a specific effect. Yeasts will consume all available glucose and then die from lack of further nutrition and from their own byproduct, ethyl alcohol. The sweetest fruit makes the strongest drink, because the yeast has more to work with. Most sweet cider contains just enough natural sugar to result in a spirit of three to six percent alcohol, making it a mildly alcoholic beverage that the ploughman of yesteryear could enjoy with his lunch while keeping his furrows straight in the afternoon. Gardening for the Homebrewer: Forget farm to table – go from garden to glass! There’s no feeling quite like cooking with home-grown carrots or grabbing a fresh handful of cilantro from your own yard. Well, unless you’re growing fruits, vegetables, or grains for brewing that is. Gardening for the Homebrewer is an introduction to the wide variety of plants that you can use for fermentations or infusions. Learn how to tell if your yard is a perfect site for barley or whether it’s better suited to a fragrant collection of herbs. Learn how to grow, dry, and store fresh hops. Or go off the beaten path and grow everything you need for your first gruit, cider, perry, or fruit wine. Have just a balcony or a windowsill? No problem! A variety of plant recommendations will suit gardeners of all types, even ones with limited space. Wendy Tweten is an award-winning writer and speaker who lives and gardens (and occasionally imbibes) on the Kitsap Peninsula in the Puget Sound. Along with her alter-ego, Miss Snippy, she contributes to a number of national and regional publications and websites. She is a regular columnist for the Kitsap News Group family of publications, and her work as been featured in Organic Gardening, Northwest Garden News, Master Gardener magazine, and Home by Design among others. She has won four Garden Writers’ Association silver awards and two gold awards for her writing. Wendy’s philosophy is simple: Design, color theory, and impressing the neighbors aside, the true function of a garden is to entertain the gardener. Debbie Teashon is a freelance garden writer, author, and award-winning photographer based on the Kitsap Peninsula in Washington. She has gardened most of her adult life and written about it for over two decades and her photography career spans four decades. Debbie’s articles and photographs have appeared in magazines such as Fine Gardening, Master Gardeners, West Sound Home and Garden, Master Gardeners, and The Oregonian among others. As a plantswoman, she spends her time gardening, taking classes or researching plants for articles and the online plant database she maintains on Rainy Side Gardeners (www.rainyside.com), a website to help gardeners in the Pacific Northwest.